Renishaw is an established world leader in engineering technologies, with a strong history of innovation in product development and manufacturing. Since its formation in 1973, the company has supplied leading-edge products that increase process productivity, improve product quality and deliver cost effective automation solutions. Renishaw's laser melting process is an emerging manufacturing technology with a presence in the medical industry, as well as the aerospace and high technology engineering and electronics sectors. Laser melting is a digitally driven additive manufacturing process that uses focused laser energy to fuse metallic powders into 3D objects. Chris Williams from Empire Cycles had been using Additive Manufacturing components in production for many years, but wanted the opportunity to test it out on a full bicycle product. He contacted Renishaw and explained the situation. The team at Renishaw thought that a standard simple part of the bicycle like the seat post would be the best fit for additive manufacturing and weight reduction, as this is a known entity and simple enough to validate and test. In order to design the seat post component with less material and weight, Renishaw used solidThinking Inspire to perform concept generation. 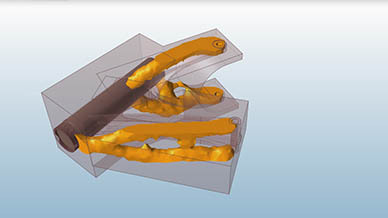 Inspire allowed Renishaw to quickly and easily generate the ideal part shape in the concept development stage of the design. A tool such as Inspire goes hand in hand with additive manufacturing by generating component designs that maximize the benefits afforded by the freedom of the process. 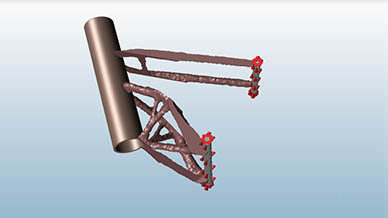 This leads to stronger and lighter components that can often not be produced with traditional manufacturing techniques. The original CAD data was imported into Inspire, and retaining bolts and the seat post were modeled. This enabled the retaining bolts to be fixed and acting forces applied to the end of the seat post. The part was defeatured to maximize the design space, allowing Inspire maximum design freedom. Next, the ideal part shape was generated using Inspire. Then a second iteration was carried out using a smaller design space to further refine the shape. 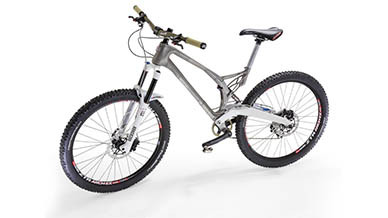 A process incorporating the concept generation of solidThinking Inspire and Renishaw’s additive manufacturing technology to create the world’s first additive manufactured metal bicycle frame. 44% weight reduction in the bicycle’s seat post when using Inspire for concept generation. Additive manufacturing and design contributed to overall weight reduction of 33%. The new material layout generated by Inspire provided a concept that not only met the performance targets but was also lighter than the original. Chris then took this model and used his own design know-how to generate suitable geometry around the concept for additive manufacturing. The ultimate aim of the project was weight saving, and the resulting parts are designed for maximum strength with minimum weight. Chris noted, "We took the seat post bracket from 360 grams down to 200 grams." After seeing the huge weight saving achieved on this single component, Renishaw and Empire’s scope suddenly expanded. In terms of strength, the Inspire influenced seat post bracket has already been tested to the British Standards, which includes exerting 1,200 newtons applied and released for 50,000 cycles at no more than 25 hertz. “We thought why not test to destruction and see how strong it really is – so far it has exceeded the standard 6 times, at 300,000 cycles and counting. This is after stress relief only; we are planning advanced heat treatments, such as Hot Isostatic Pressing (HIP) which could improve the properties even further." The benefits of the interaction between solidThinking Inspire and additive manufacturing are obvious. Inspire offers the best way to create load driven structures and enables the industry to unlock the enormous lightweight design potential related to use of additive manufactured structures. Renishaw is a global company with core skills in measurement, motion control, spectroscopy and precision machining. It develops innovative products that significantly advance its customers' operational performance - from improving manufacturing efficiencies and raising product quality, to maximizing research capabilities and improving the efficacy of medical procedures.